We've been busy busy (what's new?) and wanted to share some birth announcements we've worked on the past few months. I feel so honored when asked to design these, I love the chance to make something so personal for each family and little one. 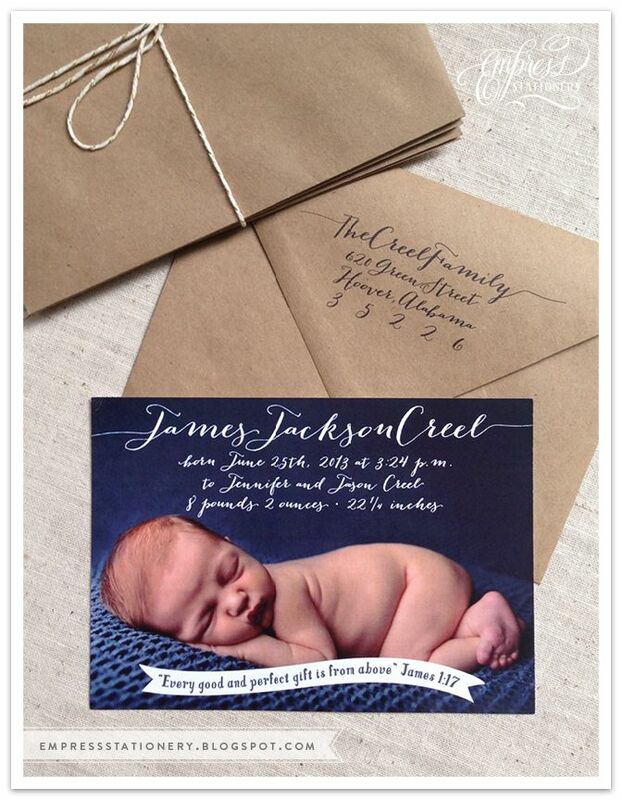 I was so excited when a former co-worker of mine asked me to design her little girl's birth announcement. And I'm obsessed with her name...Sweet little Cora Elizabeth. I have been saving this beautiful Japanese crane patterned paper for the perfect project, and thought it would be perfect for the liners on the pale blush envelopes. The announcements are printed front and back, with Cora's name and birthday details on the front, and the back includes her little monogram. Jennifer has been a friend of mine since sixth grade, and I was thrilled when she married a boy from our graduating class (Jason) and they a precious baby boy. I'm so happy to work with Jennifer and Jason and help announce Mr. James. Jennifer wanted the announcement to be simple, and photography-based. The kraft envelopes are one of my favorites, and I love the verse she chose for the bottom. Pam and I met through mutual friends, and asked for a custom monogram to be included on Mr. Harrison's announcement, along with multiple pictures (photography credit: Morgan Trinker). I loved the color of his little blanket in the picture on the back, and we let that shape the color scheme of mint and gray. 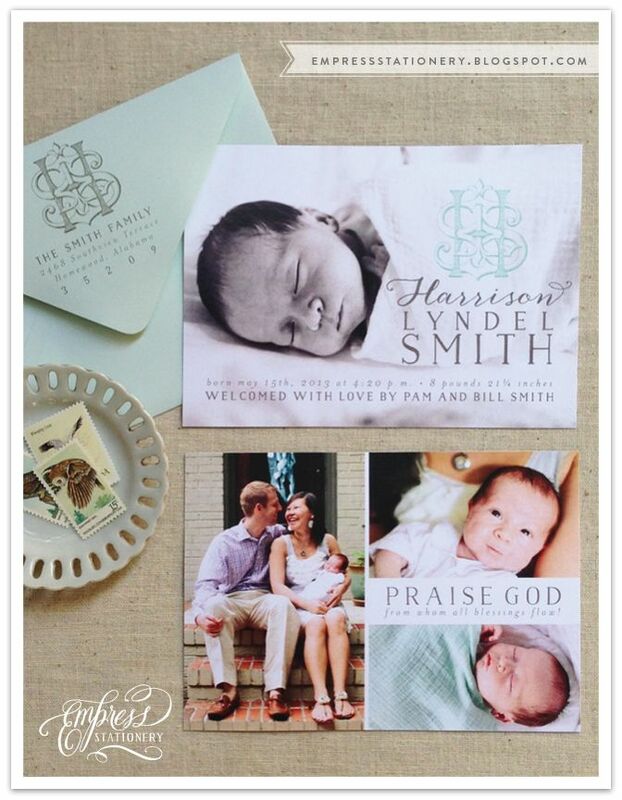 A classic monogrammed announcement...you can't go wrong! 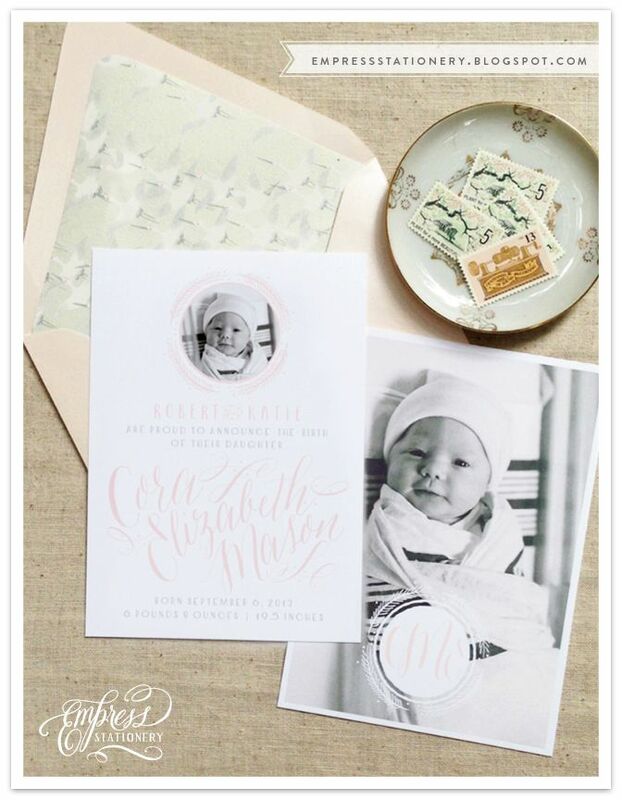 Featured on Elizabeth Anne Designs! Megan + Britton: Featured on Style Me Pretty!